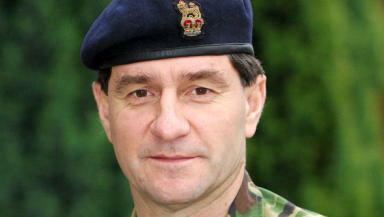 Major General David Shaw will head up a division of 25,000 troops and will also act as governor of Edinburgh Castle. The new head of the Army in Scotland, Northern Ireland and the North of England has taken up his post. Major General David Shaw takes charge of the Army's 2nd Division, the largest regional forces division in the UK with almost 25,000 troops. He will also take up a ceremonial role as governor of Edinburgh Castle, following in the footsteps of Queen Margaret and General Thomas Napier. Major General Shaw was born and brought up in Sri Lanka and was commissioned into the Royal Artillery in 1976. He went on to become an instructor at Sandhurst and has served in Germany, Cyprus, Bosnia, Northern Ireland, Canada, Hong Kong and Kenya, as well as all over the UK. Immediately before taking up his post in Edinburgh, Major General Shaw was the Army's director of media and communication at Headquarters Land Forces in Wiltshire. He replaces Major General Andrew Mackay, who was awarded the CBE for his frontline services in Helmand but quit his post in September. It was reported he had stepped down because he had become frustrated with the Army's strategy in Afghanistan. However, the MOD refused to comment on the reasons for his decision, saying it was a "private matter" for him.